A blueprint for the next decade of air travel at Bristol International Airport was unveiled on Wednesday. 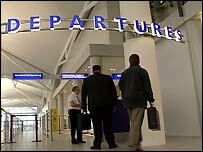 The government says passenger numbers flying from Bristol will almost double to eight million a year by 2015. As such, airport bosses want to expand the terminal, increase parking facilities and build a new hotel. Consultation on the plans is expected. A Stop Bristol Airport Expansion campaign has also been launched to fight the proposals. It is made up of Bristol Friends of the Earth (FoE), the Campaign for the Protection of Rural England and the Parish Councils' Airport Association. Pip Sheard, of Bristol FoE, said: "The expansion would be a climate change disaster. "People and councillors across the area need to wake up to what the expansion will bring: traffic misery, increased noise, road schemes and countryside development." The airport says it has no plans to lengthen the runway or increase night flights. Their plans include doubling the size of the terminal, increasing parking with a multi-storey car park and building a 120-bed hotel. The plans would create an estimated 1,500 new jobs. Managing director Andrew Skipp said the airport was meeting demand. "I think the implications will be less than people expect," he said. "The government has already consulted on the balance between the environment and the economy. They've realised that the economic benefits outweigh the environmental problems. "A lot of work is going into making the industry more environmentally friendly."